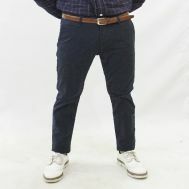 Without formal pants, we fail to impress or deliver a message about our personality, especially when it counts the most. The formal pants add elegance and iron out the casual elements from our attendance. Order the discounted striped, cotton, mud-brown cotton, navy small checkered, light-dark brown small checkered and coffee brown formal pants to complete the divine corporate looks. Order formal pants in best prices at Savers Pakistan.